For flights, check out my web page on Airline Flights - How to Find the Best Deal. Here there are many tips to reduce flight costs. One way is to travel during shoulder season from May to mid-June or September to mid-October. This is not always possible with kids in school. Remember, to book flights as early as possible. Smartertravel.com has info on sale flights from many airports. Travelocity.com has Fare Watcher Alert for desired flights. A Frequent Flier Program will have a Special Deals Newsletter. Try United Airlines. Try a second airline and their Special Deals Newsletter. Try American Airline or better yet Southwest Airlines. The big secret on reducing transportation costs is to slow down and visit only a few places. For instance, choose a city or a beach for most of a vacation. This will help reduce both travel time and stress for all. Train travel in Europe can be a good value. This can include family passes and the like. 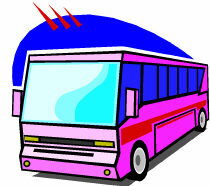 For tips on local transportation options, check out my web page on Bus Travel - City and Regional. If there are four or more people in the group, reduce costs by renting a car. For larger families, van can save even more money per person. Find inexpensive hotels by clicking on Hotel Prices - Great Deals on Lodging. Consider a home swap with a family in a foreign country. The home automatically includes cooking facilities and maybe the family car. Check with my web page on Hotel Alternatives for Family Travel for more details. Access to a summer cottage or villa can be a real winner. Access to the locals and local deals are automatic. Other inexpensive options are campgrounds. European campgrounds are ideal locations to take a family. They are so family travel oriented that Europeans, themselves, flock to them. They can be located inside cities like Paris or Munich (I kid you not) or near wonderful beaches or national parks. They always have easy access to local transportation. Imagine how fast a child can learn about another culture by running around with local children in a campground. These places are extremely safe. Everyone looks out for each other here. Find Kids-Eat-Free places in America. Another way to save money is to buy food for a picnic. This can be very inexpensive and an adventure in itself. Fun for the whole family. Everyone can discover great food, luscious pastries, great delis, and tasty local wine. Another way to save money is to simply walk or take a hike. It's the best way to see more, spend less, and have an amazing time. Check out my web page on Taking a Walk. Ask the locals for ideas on family travel and find more ways to have fun without spending a lot of money. See if there is a local festival or sporting events. Normally these do not have an entrance fee and come complete with local fast food and free entertainment. Locals are proud of their culture and heritage. They are happy to share it all with new friends from another country. It's usually no trouble to find somebody who speaks English and can say what's going on and how to join it. Remember to be a good guest. This entails patience and enthusiasm about this new culture and its people. Check out the guidebooks to see if there are free days for museums and other attractions. However this can be the worst time for visits due to overcrowding. Find the tourist information booth and see what's happening concerning family travel. Ask questions at the front desk of your campground or hotel for more details. Another great way of getting around is to rent bicycles for everyone in the family. Cycling is a great way to see a city or the countryside. Plenty of exercise and fresh air make for a great day. One tip is to travel by train to a starting point. Rent bicycles at the train station there. Bicycle to the next town along a winding river or down a scenic road. Drop-off the bicycles at the station and return to the hotel on the next train. Pick sunny days for outdoor activities such as bicycling and rainy days for indoor activities like museums or the like. These are just some quick ideas of how to save money and have a great trip for families and family fun. Check the guidebooks for more ideas on family travel and details on specific areas.